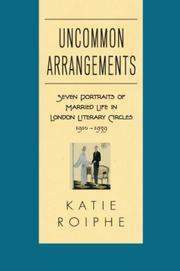 Tidily composed, broadly researched examination of seven unconventional early modern marriages. Cultural critic and novelist Roiphe (Still She Haunts Me, 2001, etc.) is drawn to artists who flourished between the two world wars because they were torn between Victorian and modernist sensibilities, their unions subject to conflicts and contradictions not unfamiliar to couples in our own era. Acknowledging her subject’s “natural prurience” only to brush aside doubts (“Why should it be prurient? Marriage is perpetually interesting.”), she delves eagerly into the intimate lives and letters of those in marital conflict and revels in their posturing. Inveterate womanizer H.G. Wells, for example, idolized his stay-at-home wife Jane even while carrying on with Rebecca West and asserting in his work the value of free love. Ailing, ethereal short-story author Katherine Mansfield and critic John Middleton Murry enjoyed a curiously chaste, childlike marriage; they lived largely apart, so their relationship remained abstract and purely romantic. By sheer force of her generous personality, Virginia Woolf’s sister Vanessa was able to maintain her marriage to Clive Bell, nurture three children and keep several lovers around her at the same time. Aristocratic hostess Ottoline Morrell was shaken by the revelation of her husband Philip’s infidelity, even though her own numerous affairs included a long-term entanglement with Bertrand Russell. Novelist Radclyffe Hall had been faithful to Una Troubridge for 18 years when she became besotted with a Russian nurse and persuaded them both to join her in a tense “trio lesbienne” that endured for more than a decade. Vera Brittain and Winifred Holtby weren’t lovers, but Brittain found more happiness living with her girlhood friend than with husband George Gordon Catlin. Memoirist and novelist Elizabeth Von Arnim, today less well known than the others, also favored rule-breaking alliances. Pretty prose and a pleasing subject for lovers of literary gossip, but Roiphe doesn’t come up with any real revelations about some very familiar figures.